While being sick is generally an unfun thing to do (I say "do" as if it's something one actively pursues. Uh, no), as a beauty blogger it comes with a specific territory of challenges - redness, dry and flaking nose and mouth - on top of the general malaise. My body decided to stick it to me all at once too, so on top of that, I have a huge pimple above my mouth and, I kid you not, one on my bottom eyelid that's basically on my eye. Who has energy to think about makeup when they're so busy feeling sorry about themselves? Not me. I have been on-and-off almost sick for a week (hence the silence. Sorry) it's like those diseases are taunting me. Perhaps I should be grateful I'm at the stage where I'm not sick enough to warrant being in bed all day, but being on the brink for this long quickly gets old. I have nothing to give you beauty-wise, except I have been makeup free for an entire week, and as much as I dislike admitting my mom is right, my skin does fare better from this imposed holiday. My skincare routine is also nonexistent, basically only three drops of Kiehl's Midnight Recovery Concentrate at night to soothe the dryness. The ring above was one of those little indulgences that turned out to be so worth it considering its increase to my personal happiness. Throughout the years I've accumulated tons of jewelry that I barely wear, even though I was tempted to procure it at the time, so by now I am well-versed with avoiding those purchasing pitfalls. While the majority of rings on Catbird make me clutch my heart for both pretty and monetary reasons, this dainty alphabet band is a (relatively) palatable $96. It has not budged from my finger for the past month, and though it becomes a problem when in contact with knitted sweaters, I continue to take my chances. That ring is adorable! 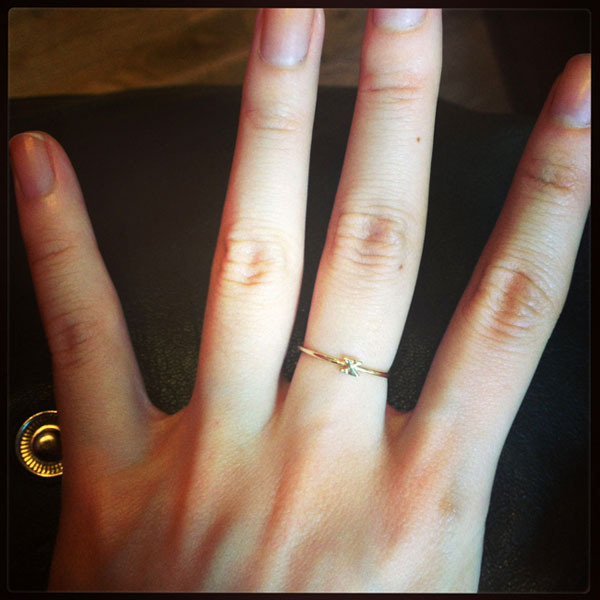 I love dainty little rings - totally makes me happy, so I can see why it would do the same for you! I've had my Catbird rings for the longest time and I love them! A little silver M and a silver heart that I wear stacked together. The silver price is easier to swallow at I think $56 or so. Their first knuckle and teardrop rings are equally gorgeous. I'm dangerous in that store. That ring is precious! Hope you are feeling better and back to perfect health soon. Have I told you yet that I adore this ring? because I do. Please take care of yourself and get well soon, my dear!